There will be a record 578 breweries serving 2,700 beers (the biggest selection ever) in the festival hall at the 2012 Great American Beer Festival (GABF). There are 676 breweries entered into the competition with 154 first-time entrants. 84 categories of beer will be judged, covering 135 beer styles, as well as the GABF Pro-Am. Texas has its largest showing ever with 30 breweries listed, up from the previous year of 22. The map of the 2012 GABF convention floor is available on the website. The brewery tasting booths are arranged by region of the country and the attending breweries from Texas are in the Southwest section. If you have any specific breweries and beers that are a "must try", I strongly suggest you download the .pdf file and print the the map and mark the location of those booths. It can be overwhelming and chaotic in the convention center (particularly if this is your first time) and you will definitely miss out on some great beers if you just wander up and down the rows (save that for after you've got to the ones you wanted). Have a smartphone? 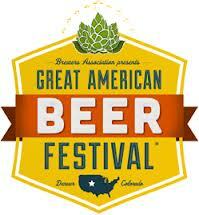 Make sure you download the free GABF app for iPhone and Android.